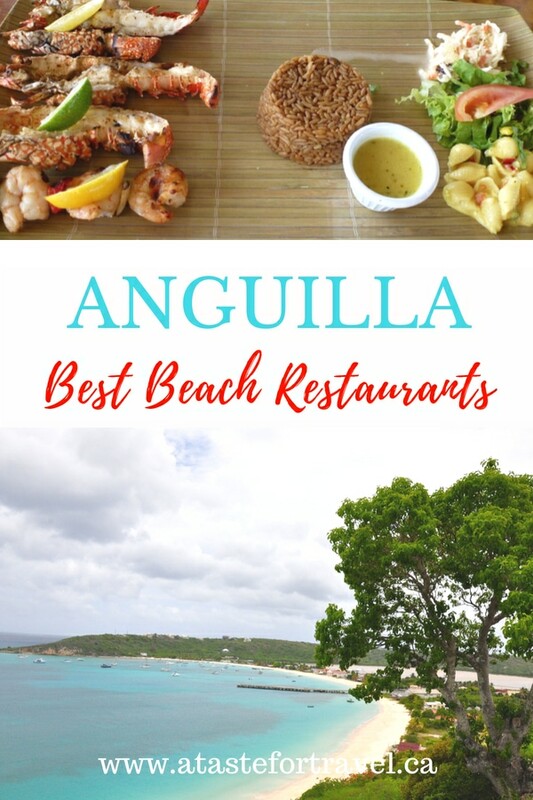 Looking for some great food on Anguilla but don’t want to roll up your towel and leave the beach? Located in the British West Indies of the Caribbean, Anguilla is composed of 33 uncrowded beaches and offshore cays. Languid beach days and warm tropical nights with the sound of reggae music catching on the breeze —that’s the pace of life on Anguilla, a British Overseas territory located next to St. Martin/Ste Maarten. When it comes to laid-back dining, there is no better place to be than Anguilla if you’re a food lover. 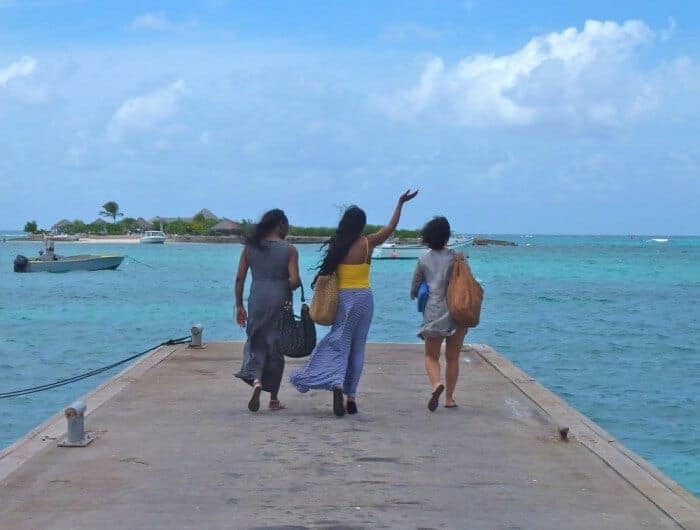 Because on this still relatively undeveloped island, you can enjoy casual dining along with fantastic local flavours and great traditional cuisine without even leaving the beach! Here’s our guide to the best restaurants, beach shacks and food trucks to check out on Anguilla. A bartender waving from a nearby beach shack catches my attention, and the Bacardi logo and possibility of a public phone are enough to lure me over. 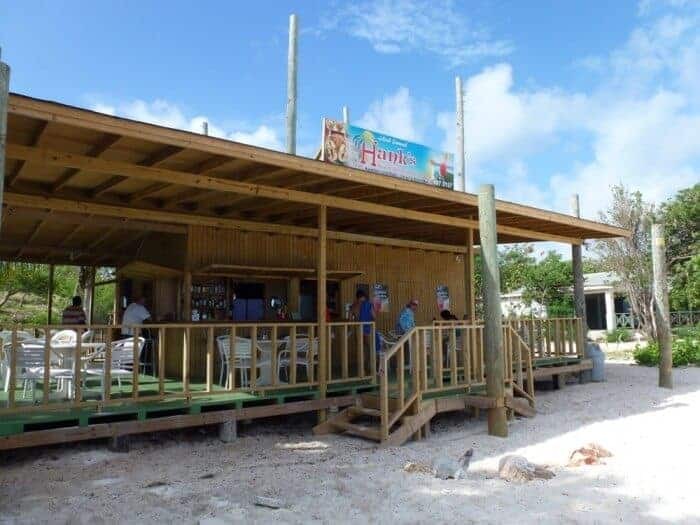 The restaurant on Scilly Cay off the northeast shore at Island Harbour is not much more than a picnic shelter in the sand, with calm sapphire waters on one side and determined waves on the other. In between, owner Eudoxie Wallace presides over an open-air kitchen and bar. I peer into the water and spot a trio of red speckled lobster swimming within a tidal pool. It serves as a natural aquarium that will keep them fresh until dinner. 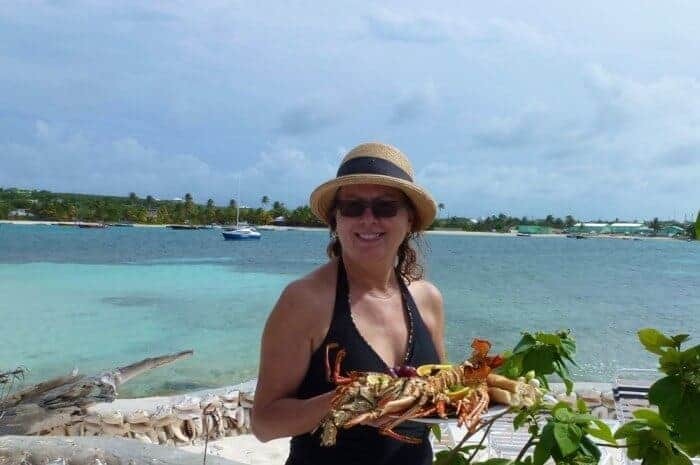 Back in the dining area, the menu–lobster, crayfish and pasta salad–matches the simplicity of the setting but my platter of seafood comes perfectly spiced and is paired with French bread as warm as the trade winds. The next morning, I do as the locals do and begin my morning with a breakfast swim at Shoal Bay. Regularly voted one of the world’s top beaches by beach aficionados, it’s a fringe of palm trees, cottony sand and blue waters. My unplugged dining choice is Hank’s, a humble outdoor eatery overlooking the sea. “Sorry for tracking in so much sand,” I say, as my flip-flops leave a trail of white footprints across the freshly-washed wood deck. While breakfast is prepared, I work up an appetite with a swim. Geologically, Anguilla is comprised of limestone created by the fossil remains of ancient sea animals and coral so the ocean floor is a marvel of bleached white sand. The ocean view and a crispy wedge of potato pancake elevate my simple plate of fried eggs to a memorable event. “You can’t go wrong with Smokey’s,” says Glennis my driver. He’s enthused over my choice for an evening meal and deftly navigates past Paradise Cove Resort along a winding road flanked by scrub brush, the low-lying vegetation of wild grape, beach morning glory and wild sage that’s abundant on Anguilla. Just when I think we’re going to disappear into a beach dune, a plantation-style building miraculously appears at water’s edge. 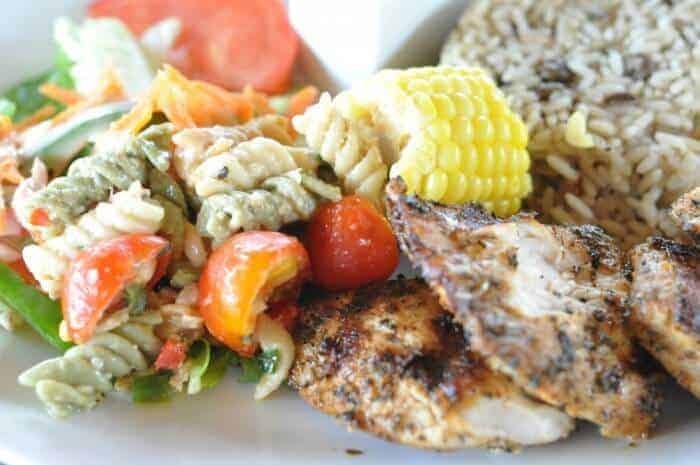 It’s Smokey’s at The Cove, where Executive Chef Leonard “Smoke” Sharplis serves up authentic Anguillian cuisine in a casual restaurant overlooking spectacular Cove Bay. 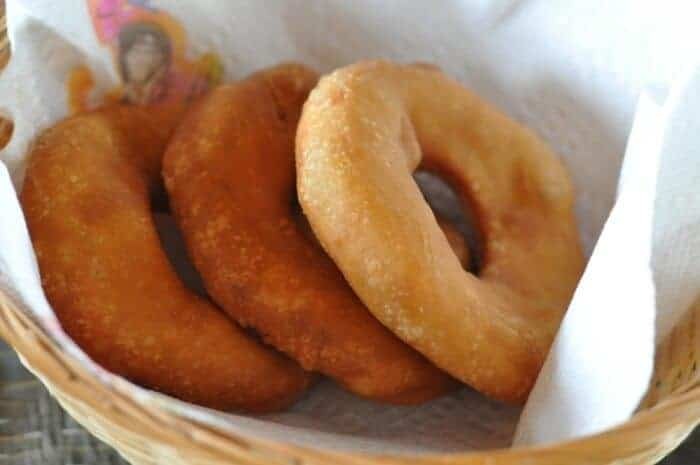 I begin my meal with a basket of Johnny Cake, a cornmeal flatbread that’s a staple on many other Caribbean islands. The name is derived from “journey cake” to reflect its origins as a food carried on long travels. 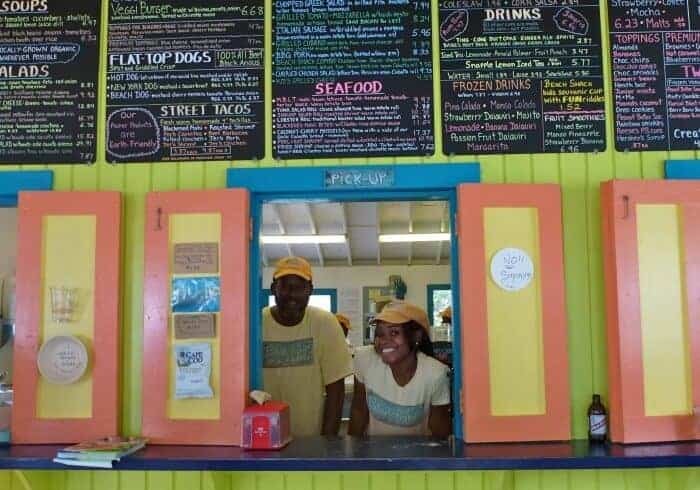 On Anguilla there are as many variations as there are cooks, but the Johnny Cake at Smokey’s comes deep-fried to a golden brown and a fluffy, melt-in-your-mouth interior. With stars in the unspoiled sky and torchlight tableside, I’m inspired to keep my dining simple. So a dish of fresh Mediterranean-style red snapper, nestled in black olives with liberal splashes of fragrant olive oil, is a perfect uncomplicated choice. Nightfall on Anguilla doesn’t mean casinos, neon nightclubs or theatrical liquid nitrogen drinks. Instead, it’s all about sand mashing (beach dancing), authentic live music and relaxed cocktails. 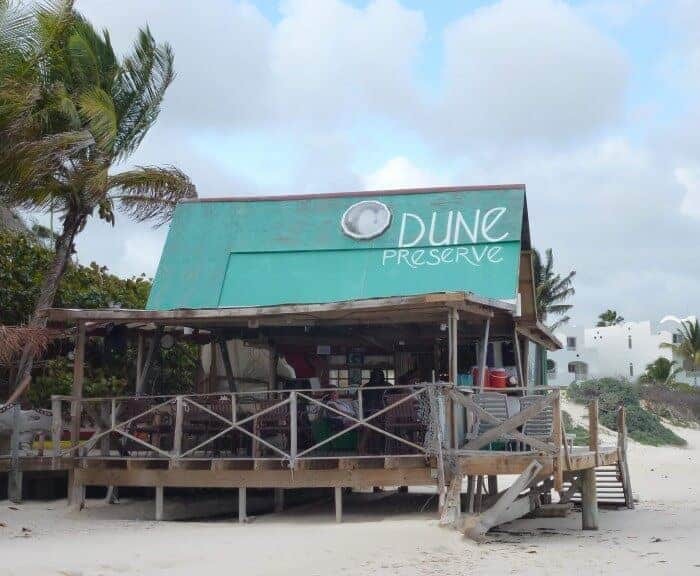 There’s no other spot that epitomizes this laid-back vibe as much as Dune Preserve. Owned by reggae musician Bankie Banx, the bar is a sprawling construction of driftwood, old boats and rope on Rendezvous Bay that feels more wooden raft than building. Although the bar is known to draw big name musicians such as John Mayer, the Wailers and Jimmy Buffett, when I arrive something else is on tap. “Tonight we’re doing spoken word,” said Bankie Banx, as he introduces performers who combine experimental poetry, theatre and radical politics in a free-wheeling exploration of politics, island life and love. I sit back on a sofa and sip a Duneshine, (the fermented ginger drink that’s a house specialty) entranced by the lapping of the waves and the flickering lights of the French island of St Martin across the bay. No neon needed. 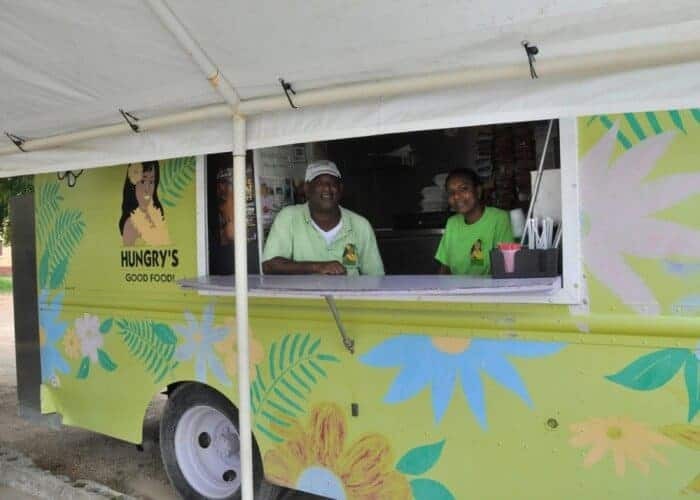 Long before the food truck trend hit North America, mobile food vending was popular in Anguilla. It answered the call of locals looking for a quick traditional meal. Hungry’s food truck is one of the most famous. 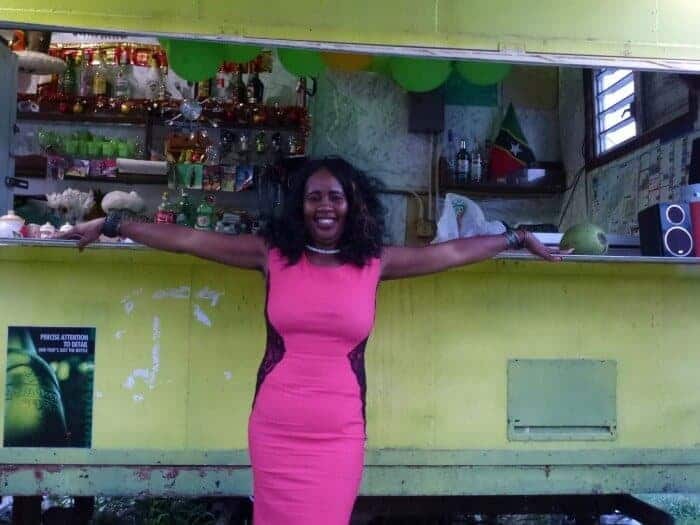 Parked under the shade of a towering tamarind tree in The Valley, the business hub of Anguilla, the lime green mobile diner is doing a booming business when we arrive. (Update: Hungry’s is now located at The Strip, a new zone for food trucks and outdoor eateries in The Valley). “Try some bull foot soup,” encourages a local, who is spooning soup into his mouth with enthusiasm. The menu features economical comfort food that hearkens back to the days of Creole home gardens filled with pigeon peas, root vegetables and corn. More of the island’s rich West Indian legacy can be seen in goat and chicken dishes, domesticated animals that can survive on Anguilla’s scrubby soil. My culinary road trip continues with a quick stop at Jazzy’s, a chartreuse food truck near the airport. Although Jazzy is best known for her pumpkin pancakes and curry chicken, she’s got a personality as big as her smile. She’s been doing a steady business at her roadside diner for nine years. When I ask to take a photo, she takes off her apron, steps out of the truck kitchen and strikes a provocative pose. “Make sure you get my whole body in the shot,” she says, her hot pink dress as bright as the neon truck she’s so proud of. 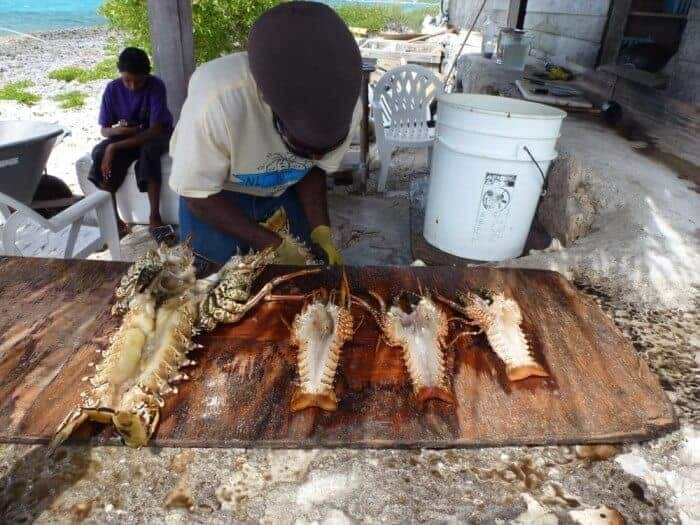 The next day, my culinary odyssey wraps up on Meads Bay on the western end of Anguilla. This stretch of pearl white beach is a magnet for celebrities, politicians and business moguls who are drawn to upscale restaurants such as Blanchard’s, the Caribbean culinary icon. For daytime dining, it’s worth trying Blanchard’s Beach Shack or nearby Jacala where reservations are needed for evening dining, but a pretty table just steps from the sand is easily had at lunchtime. Owned by Jacques Borderon and Alain Laurent, who first worked together at Malliouhana, the menu is French-inspired and barefoot chic. I sample a refreshing chilled cucumber soup with spicy tomato sorbet accompanied by bread that tastes as though it came straight from a Parisian boulangerie. Later, as I swim in the warm water alongside graceful sea fans, I decide that although Anguilla has a well-deserved reputation for upscale dining, the full taste of its Caribbean spirit can also be found in its most laid-back settings. It’s a low tech/high flavour fusion that works. 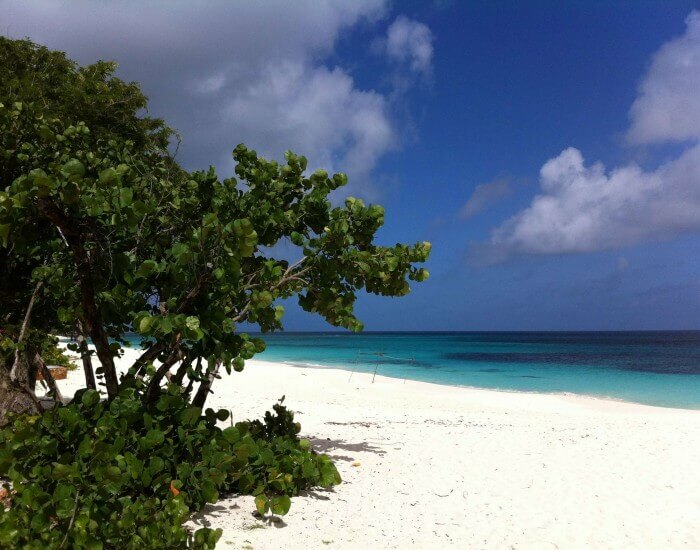 Dune Preserve: Located beside CuisinArt Resort & Spa on Rendezvous Bay. Closed Mondays. Call 264-729-1328. Jazzy’s: Located near the airport road at 264-235-4748. 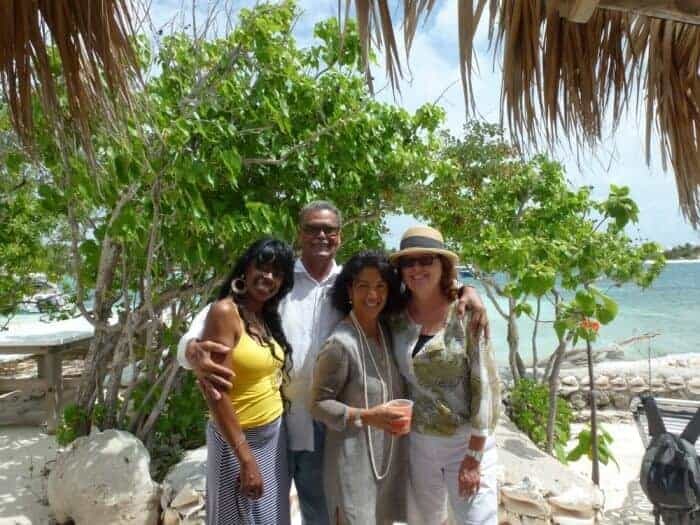 Jacala: Located on the beach road parallel to Mead’s Bay Call 264-498-5888. 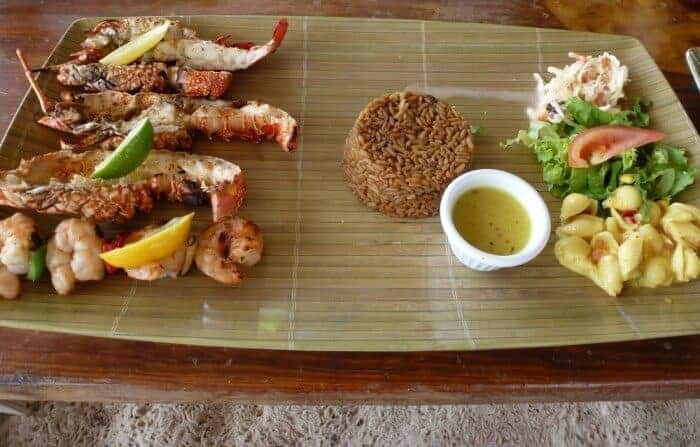 CuisinArt Golf Resort & Spa: Try the weekly Endless Lobster BBQ Buffet for fresh lobster, Johnny Cakes, grilled red snapper and other Anguilla specialties. Dune Preserve is located on the beach next door. Check prices for CuisinArt Golf Resort & Spa. 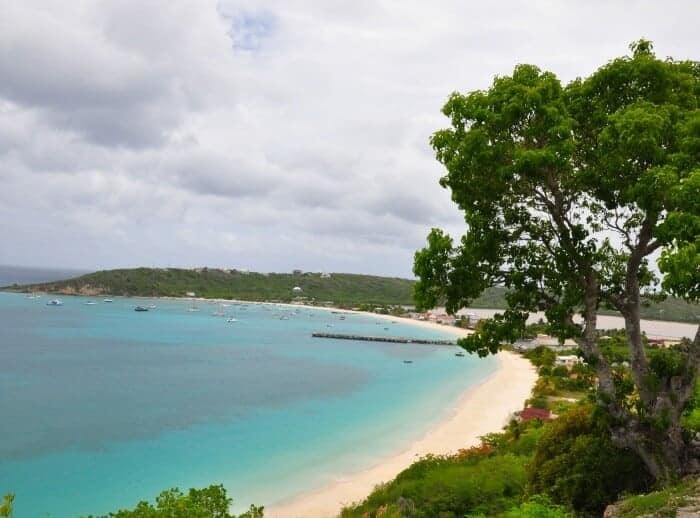 Shoal Bay Villas: This family-owned oceanfront property offers reasonably priced villa suites with fully-equipped kitchens and views located on the of the best beaches on Anguilla. Check prices for Shoal Bay Villas. 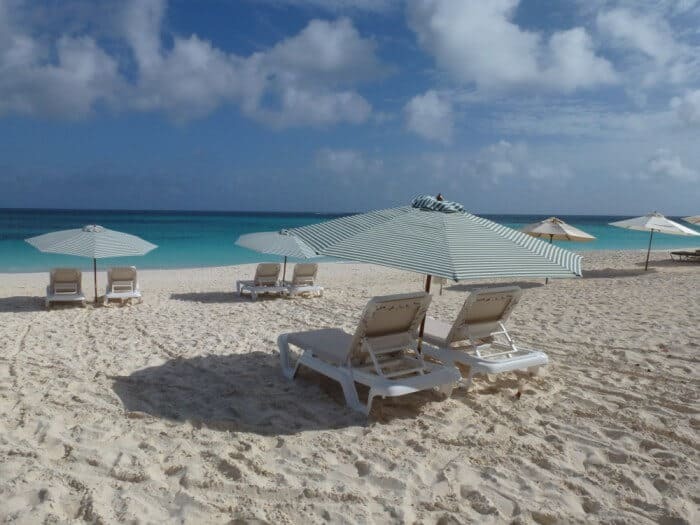 Anguilla looks a fabulous place to chill out and relax. You had me at lobster! OMG those Lobsters! They seriously made me salivate. Last year when we travelled around Australia we went to the Lobster capital of West Australia – Geraldton and we went to the lobster processing factory. Some the lobsters were monsters! Having just spent some time in Mexico and the Caribbean I have full appreciation of Mexican Food. I loved sitting on the beach with a margarita and a tasty taco. Stunning photos! OMG those lobsters are amazing! I was seriously salivating. During our around Australia travels in 2014 we visited the lobster capital of West Australia – Geraldton. We went to a lobster processing factory. Some of the lobster were monsters! Having just returned from Mexico and the Caribbean in May I can appreciate this food. I liked nothing better than sitting on the beach with a margarita and a tasty taco. Wow – what a spectacularly beautiful place Anguilla is. It looks like an incredible place to visit. It looks amazing and I like the sound of the more chilled pace of life! Wow! Love that white sand, and crayfish. Actually all of the restaurants look like my type of place. Nice and casual. Wow this looks like a relaxing place to stay, and look at that blue ocean and white beaches! beautiful. I want to go there now! Thanks for the great post. I enjoyed meeting you from your link over on Lifestyle Fifty today. Happy travels and have a great week.